So along with the Nuforce NE-700 that I received in for review the other day there was quite a nice little surprise included. 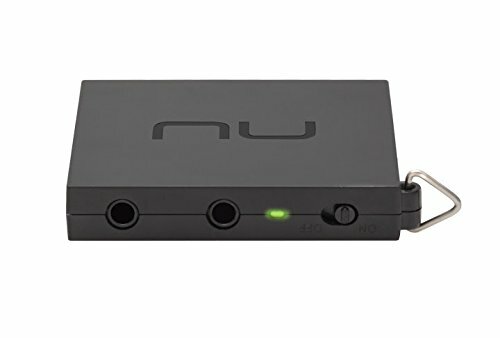 The new Nuforce MMP (Mobile Music Pump). A tiny little amp to be used, I'm sure, with mobile phones/tablets whilst on the go. It offers a bit more power than you normally get out these sources but also features the clever trick of being a high powered headphone splitter at the same time. We take a closer look at this excellent little device. Loved the packaging. In a world of oversized boxes and plastics and other assorted nonsense this is just quite simply a box made out of thick card with some graphics on it. No bigger than a large pack of matches there is absolutely minimal waste going one here. Good job Nuforce. Its also nice to see that the box doubles as the instruction manual with all the user information printed on the inside in clear and concise fashion. A couple of cables for connecting the amp up are all thats included other than the user guide printed on the box. One cable is included for charging and the other is for connecting to the amp from a source via 3.5mm jack. Fairly standard but at this price theres not much more you should expect anyway. The MMP looks good. Not much more than a simple plastic box with a couple of wires it has a nice texture to it and good branding with Nuforces “NU” logo on top in stark red. My time with the MMP was spent with it attached to the white Nexus 5 and it did look like a very cool pairing and complimented the phone well. It is very light in the hand which is good but the plastic did feel a bit cheap and hollow, nothing to much to worry about as this plastic usually stands the test of time and the fit and finish was really good. Overall its hard to complain. *Battery life - we tested the battery a couple of times from full charge to full drain and found that we were getting just under 2 hours over the 8 hour run time which was pleasing. Certainly enough to get through a long day of listening. The main point of the MMP is going to be for those users looking for a little more driving power or a touch more bass control over their setup. Especially this is the case in the market of mobile phones as most phone amp sections are left wanting. This usually leads to the unfortunately common issue of poor bass response and low volume / driving levels. In that regard the main testing for the MMP was carried out in use with a nokia 820, Nexus 5 and Iphone 5 respectively. The other reason that this device is aimed at mobile phones in particular is that there is no volume control on the amp itself relying solely on the phone/source for full volume control. So we connected the little guy up and the difference is immediate in the case of the Nokia and Nexus phones when used in combination with power hungry headphones along with some of the more less efficient IEM's. We are talking both multi BA and hybrid customs and universal, they were the ones which benefited most. Bass response tightens becoming both quicker and cleaner/natural in presentation. Quantity is not affected to the extent that it is noticeable (and shouldn't as unlike on the Fiio models you wont find a bass boost switch). Actually when we compared to something like the Fiio E11 the Nuforce was so much more clean and clear that the rather than the oft dark and veiled sound we get from the e11. No its not as transparent as our JDS c421, for its price it certainly punches above its weight. If you were looking for a more traditional design, with more features we would still say the SMSL SAP-4s is a great option as well. The mids, which were largely strangled on our multi armature IEM's straight from the Nexus were opened up became much more realistic cleaner and clearer. They sounded much more open and detailed than when the MMP is connected. In fact highs performed very similar to that of the mids which shows that what this little amp is actually doing is providing adequate power to the headphones so that they can perform optimally. The one feature that is really stand out is the extra oomph on the headphone splitter connection. Most splitters go through a simple jack and power is split 2 ways. This, most of the time, dramatically reduces sound quality. You can imagine that a source already struggling with something like a superlux hd660 or similar would sound even more sucked out when another headphone is eating its power. Were happy to see that Nuforce have ample power to drive both to good levels that allowed myself an my partner to watch a movie on our most recent flight. Her with the 160Ω HD660 and myself with Minervas new Chris Sennet Mi-Artist Pro Multi armature custom monitors. This was done with source volume set at about 65%..... 100% volume on a regular splitter with the same setup was barely useable. The MMP by Nuforce is a great product in that its one of the few mini-amps which do what an amp should actually do. It should boost the power to drive headphones that require the extra juice. It shouldn’t add its own colour to it rather than showcase what is already there. The Nuforce does all this in a nice form factor at a good price. The performance is spot on leaving competitors like Fiio's e11 and e6 in its dust largely due to its purer unadulterated sound reproduction. The amped splitter ability is again an excellent bonus feature and works perfectly. So for anyone out there that needs a power boost from out of there mobile phone, given its price and form factor, the Nuforce MMP is a very hard package to beat.